Crazy Horse was born on the Republican River about 1845. He was killed at Fort Robinson, Nebraska, in 1877, so that he lived barely thirty-three years. He was an uncommonly handsome man. While not the equal of Gall in magnificence and imposing stature, he was physically perfect, an Apollo in symmetry. Furthermore he was a true type of Indian refinement and grace. He was modest and courteous as Chief Joseph; the difference is that he was a born warrior, while Joseph was not. However, he was a gentle warrior, a true brave, who stood for the highest ideal of the Sioux. Notwithstanding all that biased historians have said of him, it is only fair to judge a man by the estimate of his own people rather than that of his enemies. The boyhood of Crazy Horse was passed in the days when the western Sioux saw a white man but seldom, and then it was usually a trader or a soldier. He was carefully brought up according to the tribal customs. At that period the Sioux prided themselves on the training and development of their sons and daughters, and not a step in that development was overlooked as an excuse to bring the child before the public by giving a feast in its honor. At such times the parents often gave so generously to the needy that they almost impoverished themselves, thus setting an example to the child of self-denial for the general good. His first step alone, the first word spoken, first game killed, the attainment of manhood or womanhood, each was the occasion of a feast and dance in his honor, at which the poor always benefited to the full extent of the parents' ability. Big-heartedness, generosity, courage, and self-denial are the qualifications of a public servant, and the average Indian was keen to follow this ideal. As every one knows, these characteristic traits become a weakness when he enters a life founded upon commerce and gain. Under such conditions the life of Crazy Horse began. His mother, like other mothers, tender and watchful of her boy, would never once place an obstacle in the way of his father's severe physical training. They laid the spiritual and patriotic foundations of his education in such a way that he early became conscious of the demands of public service. He was perhaps four or five years old when the band was snowed in one severe winter. They were very short of food, but his father was a tireless hunter. The buffalo, their main dependence, were not to be found, but he was out in the storm and cold every day and finally brought in two antelopes. The little boy got on his pet pony and rode through the camp, telling the old folks to come to his mother's teepee for meat. It turned out that neither his father nor mother had authorized him to do this. Before they knew it, old men and women were lined up before the teepee home, ready to receive the meat, in answer to his invitation. As a result, the mother had to distribute nearly all of it, keeping only enough for two meals. On the following day the child asked for food. His mother told him that the old folks had taken it all, and added: "Remember, my son, they went home singing praises in your name, not my name or your father's. You must be brave. You must live up to your reputation." Crazy Horse loved horses, and his father gave him a pony of his own when he was very young. He became a fine horseman and accompanied his father on buffalo hunts, holding the pack horses while the men chased the buffalo and thus gradually learning the art. In those days the Sioux had but few guns, and the hunting was mostly done with bow and arrows. Another story told of his boyhood is that when he was about twelve he went to look for the ponies with his little brother, whom he loved much, and took a great deal of pains to teach what he had already learned. They came to some wild cherry trees full of ripe fruit, and while they were enjoying it, the brothers were startled by the growl and sudden rush of a bear. Young Crazy Horse pushed his brother up into the nearest tree and himself sprang upon the back of one of the horses, which was frightened and ran some distance before he could control him. As soon as he could, however, he turned him about and came back, yelling and swinging his lariat over his head. The bear at first showed fight but finally turned and ran. The old man who told me this story added that young as he was, he had some power, so that even a grizzly did not care to tackle him. I believe it is a fact that a silver-tip will dare anything except a bell or a lasso line, so that accidentally the boy had hit upon the very thing which would drive him off. It was usual for Sioux boys of his day to wait in the field after a buffalo hunt until sundown, when the young calves would come out in the open, hungrily seeking their mothers. Then these wild children would enjoy a mimic hunt, and lasso the calves or drive them into camp. Crazy Horse was found to be a determined little fellow, and it was settled one day among the larger boys that they would "stump" him to ride a good- sized bull calf. He rode the calf, and stayed on its back while it ran bawling over the hills, followed by the other boys on their ponies, until his strange mount stood trembling and exhausted. friends, in spite of the difference in age. Men called them "the grizzly and his cub." Again and again the pair saved the day for the Sioux in a skirmish with some neighboring tribe. But one day they undertook a losing battle against the Snakes. The Sioux were in full retreat and were fast being overwhelmed by superior numbers. The old warrior fell in a last desperate charge; but Crazy Horse and his younger brother, though dismounted, killed two of the enemy and thus made good their retreat. It was observed of him that when he pursued the enemy into their stronghold, as he was wont to do, he often refrained from killing, and simply struck them with a switch, showing that he did not fear their weapons nor care to waste his upon them. In attempting this very feat, he lost this only brother of his, who emulated him closely. A party of young warriors, led by Crazy Horse, had dashed upon a frontier post, killed one of the sentinels, stampeded the horses, and pursued the herder to the very gate of the stockade, thus drawing upon themselves the fire of the garrison. The leader escaped without a scratch, but his young brother was brought down from his horse and killed. While he was still under twenty, there was a great winter buffalo hunt, and he came back with ten buffaloes' tongues which he sent to the council lodge for the councilors' feast. He had in one winter day killed ten buffalo cows with his bow and arrows, and the unsuccessful hunters or those who had no swift ponies were made happy by his generosity. When the hunters returned, these came chanting songs of thanks. He knew that his father was an expert hunter and had a good horse, so he took no meat home, putting in practice the spirit of his early teaching. He attained his majority at the crisis of the difficulties between the United States and the Sioux. Even before that time, Crazy Horse had already proved his worth to his people in Indian warfare. He had risked his life again and again, and in some instances it was considered almost a miracle that he had saved others as well as himself. He was no orator nor was he the son of a chief. His success and influence was purely a matter of personality. He had never fought the whites up to this time, and indeed no "coup" was counted for killing or scalping a white man. Four Bears, and Swift Bear. 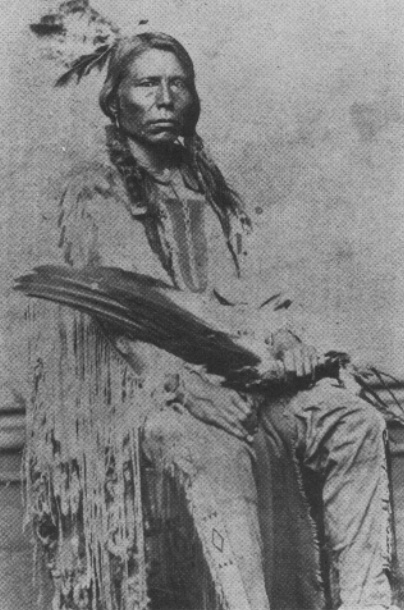 Even Spotted Tail, afterward the great peace chief, was at this time with the majority, who decided in the year 1866 to defend their rights and territory by force. Attacks were to be made upon the forts within their country and on every trespasser on the same. Crazy Horse took no part in the discussion, but he and all the young warriors were in accord with the decision of the council. Although so young, he was already a leader among them. Other prominent young braves were Sword (brother of the man of that name who was long captain of police at Pine Ridge), the younger Hump, Charging Bear, Spotted Elk, Crow King, No Water, Big Road, He Dog, the nephew of Red Cloud, and Touch-the-Cloud, intimate friend of Crazy Horse. The attack on Fort Phil Kearny was the first fruits of the new policy, and here Crazy Horse was chosen to lead the attack on the woodchoppers, resigned to draw the soldiers out of the fort, while an army of six hundred lay in wait for them. The success of this stratagem was further enhanced by his masterful handling of his men. From this time on a general war was inaugurated; Sitting Bull looked to him as a principal war leader, and even the Cheyenne chiefs, allies of the Sioux, practically acknowledged his leadership. Yet during the following ten years of defensive war he was never known to make a speech, though his teepee was the rendezvous of the young men. He was depended upon to put into action the decisions of the council, and was frequently consulted by the older chiefs. Like Osceola, he rose suddenly; like Tecumseh he was always impatient for battle; like Pontiac, he fought on while his allies were suing for peace, and like Grant, the silent soldier, he was a man of deeds and not of words. He won from Custer and Fetterman and Crook. He won every battle that he undertook, with the exception of one or two occasions when he was surprised in the midst of his women and children, and even then he managed to extricate himself in safety from a difficult position. Sioux. The soldiers had their warning, and it was impossible to enter the well-protected camp. Again and again Crazy Horse charged with his bravest men, in the attempt to bring the troops into the open, but he succeeded only in drawing their fire. Toward afternoon he withdrew, and returned to camp disappointed. His scouts remained to watch Crook's movements, and later brought word that he had retreated to Goose Creek and seemed to have no further disposition to disturb the Sioux. It is well known to us that it is Crook rather than Reno who is to be blamed for cowardice in connection with Custer's fate. The latter had no chance to do anything, he was lucky to save himself; but if Crook had kept on his way, as ordered, to meet Terry, with his one thousand regulars and two hundred Crow and Shoshone scouts, he would inevitably have intercepted Custer in his advance and saved the day for him, and war with the Sioux would have ended right there. Instead of this, he fell back upon Fort Meade, eating his horses on the way, in a country swarming with game, for fear of Crazy Horse and his braves! The Indians now crossed the divide between the Tongue and the Little Big Horn, where they felt safe from immediate pursuit. Here, with all their precautions, they were caught unawares by General Custer, in the midst of their midday games and festivities, while many were out upon the daily hunt. different directions. While Sitting Bull was pursued into Canada, Crazy Horse and the Cheyennes wandered about, comparatively undisturbed, during the rest of that year, until in the winter the army surprised the Cheyennes, but did not do them much harm, possibly because they knew that Crazy Horse was not far off. His name was held in wholesome respect. From time to time, delegations of friendly Indians were sent to him, to urge him to come in to the reservation, promising a full hearing and fair treatment. For some time he held out, but the rapid disappearance of the buffalo, their only means of support, probably weighed with him more than any other influence. In July, 1877, he was finally prevailed upon to come in to Fort Robinson, Nebraska, with several thousand Indians, most of them Ogallala and Minneconwoju Sioux, on the distinct understanding that the government would hear and adjust their grievances. ideal; his record clean. He was never involved in any of the numerous massacres on the trail, but was a leader in practically every open fight. Such characters as those of Crazy Horse and Chief Joseph are not easily found among so-called civilized people. The reputation of great men is apt to be shadowed by questionable motives and policies, but here are two pure patriots, as worthy of honor as any who ever breathed God's air in the wide spaces of a new world. Photo attributed to Crazy Horse, Some believe that Crazy horse was never photographed. However, there is a photograph which is attributed to be that of Crazy horse. I will post more in the future.